Here are the recipes we were able to harvest from our first community event. Try them at home, or for your next potluck. After you are done slicing your veggies. Mix the rest of the ingredients separately (preferably in a blender). Then boil your carrots for 8 to ten minutes. Drain your pot and then add your pepper and green onion slices. Pour your mixture from the blender over the veggies. Cover the dish and refrigerate overnight. Buy pre chopped/ sliced veggies. It will save a ton of time. Drain some of the marinade before serving so it won't be too soupy. . The recipe is a favorite in the Lomax home. Vertelle explained that her mother served often in the summer when she was a child. She thinks that the name comes from the fact that the carrots, when soaked in the marinade, resemble bright copper pennies. It's a simple dish that will brighten up any table! 2 cups of grated corn. Mix your ingredients and then put them in a greased baking dish. Bake at 350 degrees for 30 to 40 minutes. Hints: Amy Glick always used fresh corn as she lived on a farm. You can take the easy route if you like and use a 16oz can of corn. For a firmer texture put the corn in a blender before you mix it in. This is a Glick family favorite from the Dakotas. The Glicks still run their dairy farm to this day. It's working on its forth generation. 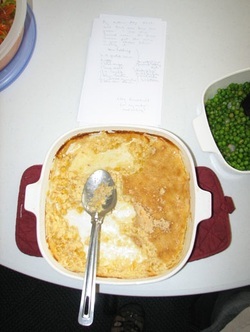 Libby serves this to her children and grandchildren on special occasionsYou might try your hand at it for Thanksgiving. Finely cut dates then beat the eggs and add the sugar to the eggs. Then mix and sift the baking powder with the salt over the eggs. Next, add dates to the egg mix. Combine and mix in with the flour. Grease a 10x 15 pan and then spread the mixture thinly over it. Bake in a 325 degree oven for 33 minutes. 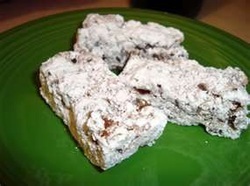 Cut in strips while hot and then roll in powdered sugar.. Hints: You can save yourself a lot of time by buying already chopped dates. 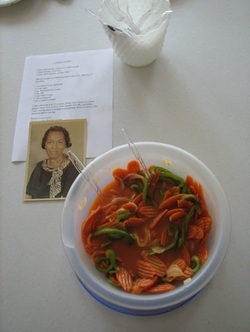 Recipe History: Janet was a legendary Hoosier music teacher. Loved by her students and family alike, these date bars were a special summer treat. You might try them out on your next picnic. Coat beef in flour by shaking the cubes in a bag. Heat oil until it sizzles. Brown each side of the beef cubes in a skillet one inch from each other. Then you need to drain the cubes on paper towels to let out some of the grease. When all your beef is browned, simmer your cubes, in a skillet wiped clean of excess grease, until tender they are tender. In a separate pan saute fresh mushrooms. (Meanwhile boil your wheat noodles according to their package's directions.) When it comes time to serve the dish add the mushroom to the beef and then stir in the sour cream. Recipe History: The recipe comes from Meg Demakas's maternal grandmother, Olga McGirr.Who was known more by her two nicknames then her actual first name. Friends called her Irish (due to her flaming red hair) and her grandkids and great-grandkids called her Gooey (from her first born grandchild's mispronouncing of the word "grandma"). Gooey's husband was an Ad Man at Swift and Company. So, they usually served great meat dishes. Excellent in cold weather, this hearty meal will brighten up the dreariest of winter nights. Mix your cabbage and carrots in a large salad bowl. Next, whisk the mayonnaise, sugar, milk, buttermilk, lemon juice, vinegar, salt, black pepper and horseradish in a separate bowl until smooth and the sugar has dissolved. Pour dressing over cabbage mixture and mix thoroughly. Cover bowl and refrigerate slaw at least 2 hours (the longer the better). Mix again before serving!. Hints:The longer you let the slaw refrigerate, the purple color will deepen. You can also vary the seasoning depending on the pallets of your audience. Recipe History: This recipe was passed down the maternal line of Jessica Renslow's family. The LaMaster women liked their coleslaw colorful. The exact origination of the recipe is not clear. It was given to Jessica from her Aunt Debbie Zimmerman (nee Renslow) who learned it from her mother Mary Jane Renslow (nee LaMaster). Now it is unclear if Mary Jane learned it from her Aunt Bertha Plank (nee LaMaster) who was one of the first women in Gary, Indiana. She ran a boarding house near US Steel that catered to the local bachelors and served large quantities of all its food. The other possible source for the recipe is Mary Jane's mother, Laura LaMaster. Laura was a cook at Purdue University for over 30 years. No matter the history, this purple slaw will put some pop into any picnic..